After getting dental braces, retainers or headgear with braces; easy to eat soft foods are recommended that do hurt of cause pain to the tender mouth or sore gums. Braces, Headgear, Retainers are prescribed by orthodontists to ultimately give you a straight, beautiful smile, teeth and jaws. But having pain in eating after braces, headgear, retainers is common problem, as every comes with a cost. The good news is the braces pain or irritation goes away in few days. Your mouth may be particularly tender for the first few days after getting braces, retainers or headgear with braces. When worn consistently, dental braces, retainers or headgear with braces generate a force to aid in the development of the upper jaw and teeth correcting the human bite. While this is a great benefit, the headgears are not without their shortcomings. For instance, they can be very uncomfortable during the first couple of days. They can also cause swelling of the gums. The close proximity of the metal can cause the gums to react unfavorably and this can sometimes lead to inflammation and dental pain. 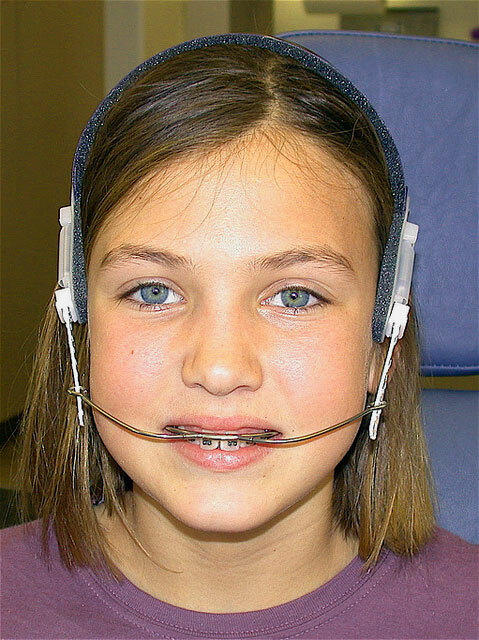 These are factors you need to keep in mind if you’re considering getting headgear braces for your child. If you already got your child braces and somehow the child was able to cope with the first two problems easily then its time to prepare for the third which is usually the most hectic: finding foods that can be eaten with the braces. According to the Center for Young Women’s Health at Children’s Hospital, Boston. Each month your braces tightened, they may also feel sore for a day or two. During these days, they recommend soft foods to eat with braces, headgear or retainers that do not hurt and help your teeth feel better. Within the first couple of days after getting the braces, it’s almost impossible to eat anything. After the procedure, the teeth are guaranteed to hurt for a while. Sometimes it can take less than twenty four hours. Sometimes it takes longer. The same is experienced when the braces are tightened. During this period, a dull pain can be felt throughout the mouth that will make chomping on solid foods difficult. Sometimes painful. As a parent, stocking up on soft foods will help your child tremendously not only to overcome the pain but to clear the dull sensation from the mouth faster. Some children might not feel any pain after only two days and might be ready to resume their old eating habits but even then orthodontists suggest they steer clear of solid foods that are crunchy, chewy or just plain hard until their braces come off. The reason; some of these foods can break off the brackets in the braces. Not only can this become a costly affair but it will also prolong the duration the braces are worn. The top foods on the list to be avoided at all costs include caramel, apples, carrots, nuts, gum, taffy and pop corn. Drinking slushies, smoothies and milkshakes is highly encouraged especially in the first couple of days after getting the braces to minimize the pain. Parents are advised to create food kits for their children who have just gotten braces. Basically, a food kit is a container of some sort that houses special food for children with braces to munch on whenever they feel hungry. Food kits are highly recommended by orthodontists because they help preserve the brackets in the braces and shorten the period it takes to have them work. Before food kits orthodontic visits after getting braces were much higher. Not many parents could keep a keen eye on their children to prevent them from snacking on forbidden foods. Many pre-adolescent kids eventually fell to the temptation after just a couple of days! Crisps, chocolate nuts, ice-cream and even caramel were the most popular culprits. With food kits, parents can greatly reduce and in some cases, completely eliminate the desire to eat foods that can damage the braces and inadvertently cause pain to the gums. Taking into consideration their child’s appetite and tastes, parents can stock up tasty and healthy alternatives to help their child stay on track. The great thing about food kits is they are highly portable and can be carried everywhere the child goes. Their primary purpose however, is to be used at home. All it takes is a little training and instruction. This is not to say they are a hundred percent effective. They are highly preferred because they have recorded a very high success rate especially among children between the ages of five and twelve. Eating soft, room temperature or cool foods for breakfast will help reduce the pain of new or recently tightened braces. Instead of putting frozen waffles in the toaster or the oven. You can additionally place them in the microwave so they are soft enough to chew comfortably. Eat cold, soft foods, like fruit salad, to help cool your mouth and minimize pain. If you are too sore to chew, eat a cup of creamy yogurt or drink a cold fruit smoothie made with seedless fruits. Forget steak sandwich for weeks, at least until your teeth and gums are less irritated. Instead, enjoy macaroni and cheese for lunch, or a cup of matzoh-ball soup. Avoid particularly chewy foods and raw, crunchy vegetables. Cook any vegetables you are craving in a pot with a small amount of warm water until they are soft enough to eat comfortably. If your mouth pain is severe, stay away from hot foods and stick with cold foods that don’t require much chewing, like cottage cheese and mashed avocado. For dinner, meats that are cooked for extended periods of time, like meatloaf or slow-cooker meals will feel the best on your sore gums and mouth. Cooked pasta, rice, couscous or quinoa may also prevent your teeth and gums from becoming more irritated. If you are feeling unable to chew, prepare polenta with mashed potatoes and creamed corn for dinner to give your gums and teeth a rest. We’ve already covered the fact that kids with braces will have a somewhat difficult time eating certain foods. What most parents don’t think about is the potential problem that might arise when they are required to take certain types of medicines. Five year olds, for instance, might find the exercise of trying to swallow with braces overwhelming and even choke on the medicines. To prevent this, start looking for liquid drug alternatives. If the child complains of pain in the gums, jaws or mouth after a brace operation consider giving them liquid advil for the pain. Liquid advil is highly recommend because it not only eliminates the pain caused by the metallic brackets but it has been proven to reduce inflammation of the gums in a very short time. Braces have been known to cause excessive production of saliva in pretty much everybody who wears them. Experts suggest it is because the metal in the mouth prevents the tongue from moving as fast thus allowing for the build up to occur. When eating, saliva is produced to facilitate easier breakdown of food in the mouth and subsequently easier digestion. Sitting next to an individual with braces you might also notice uncommon slurping. It helps to psychologically prepare for these changes way before the child gets the braces and plan how to adapt to them. Research from credible and verified sources is always encouraged. However, turning to speculation and comparing other people’s experiences might not always produce the best outcomes. Children have different genetics. Orthodontists have different levels of experience and care for their patients. Parents also have different levels of education. Some horror stories you read on the internet might convince you otherwise on the numerous benefits of getting braces for your kids which would be a tragedy. Some would make you think the entire process is a walk in the park and requires very little work, if any, on your part. Discretion is advised when reading articles, blog posts and comments online. The best solution to ensure you stay on track is to read material from authenticated sources only. Don’t settle for an orthodontist or dental hygienist you don’t feel a hundred percent comfortable with.